If your gutter system is not working the way it should, you should not wait too long to investigate the issue. Gutter cleaning by a professional gutter cleaning company in Colorado Springs can save you a lot of money in the future. If you can’t afford to hire a professional gutter cleaning company, here are a few tips you can use to keep your gutters clean and in good repair. stability of the ladder. Ideally, the ladder should be 1 foot from the wall for every four feet of height. So, the ladder should be two feet away from the wall if you going to climb 8 feet high. Usually, the gutters get clogged and/or damaged in at least three different ways including sags, cracks and holes and leaf clogs. You can easily repair minor sags and pin sized holes on your own. On the other hand, you may need professional help for repairing cracks and other types of gutter damage. Most of the times, the problem with the gutter is clogging with leaves and other debris though it may look like a leak or a crack. Various dirt, twigs and leaves accumulate in the drainage system and clog the downspouts. This happens frequently in the curved sections. To check for such blockages in the downspouts and clearing out these blockages, you just need to remove the top as well as bottom sections of the downspouts sometimes to really get at the clog. Depending on the installation of gutters, you can remove the top and bottom cover by removing the screws or by drilling out the rivets. Most of the times, you will find a lot of debris in these sections when you give these a good shake. Sometimes you can clear out a clog by using a hose and placing it down into the downspout to push out the clog with water pressure. If it’s not too cold outside, the hose method can work very well in removing downspout clogs. In Colorado Springs we don’t often get enough rainfall to clear out accumulated debris from the gutters – that’s why the hose method can work really well. For spotting pin sized holes in the gutters, careful inspection needs to be made. When you find a small pin sized hole, it is important to thoroughly clean the area with the help of an abrasive pad. Next, you need to cut a piece of material that is at least 1 inch bigger than the pinhole on all sides. Also, the same kind of material should be used for repair as the gutters. Now you need to spread gutter repair compound all around the pinhole with the help of a stiff brush. The patch is to be placed on top of this repair compound and it should be covered with another layer of compound for a good seal. For proper gutter drainage, it is important that all the gutters are well aligned. Sags in gutters may lead to leaks as water is unable to reach the downspouts in an easy manner. Water keeps collecting in the sagging area and it may lead to overflow. It is easy to repair minor sags by adding a hanging bracket to the damaged area. If it is completely damaged, it can also be replaced. You need to screw in the bracket till it is back in alignment. You also need to ensure that the hanging bracket fits perfectly with the type of gutter system you have. Inspection and maintenance on a regular basis will not only ensure better operation of the gutters but will also enhance their life. 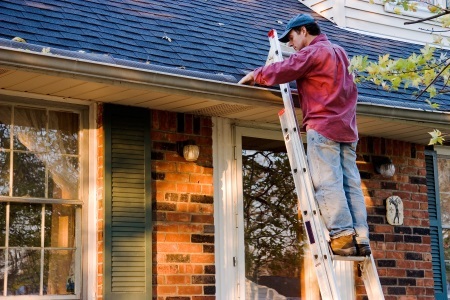 Make best use of your gutter system by doing the basic gutter repairs in the right manner.